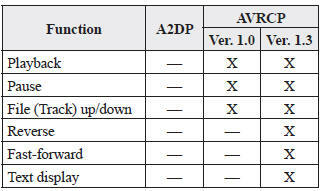 A2DP is a profile which transmits only audio to the Bluetooth ® unit. If your Bluetooth ® audio device corresponds only to A2DP, but not AVRCP, you cannot operate it using the control panel of the vehicle's audio system. In this case, only the operations on the mobile device are available the same as when a portable audio device for a non-compliant Bluetooth ® device is connected to the AUX terminal. The battery consumption of Bluetooth ® audio devices increases while Bluetooth ® is connected. If a general mobile phone device is USB connected during music playback over the Bluetooth ® connection, the Bluetooth ® connection is disconnected. For this reason, you cannot have music playback over a Bluetooth ® connection and music playback using a USB connection at the same time.